اکبرزاده, محمدرضا, خداشناس, سعیدرضا, اسماعیلی, کاظم. (1394). مدل‌سازی رواناب حوضه آبخیز اترک با استفاده از الگوریتم SUFI-2 مدل SWAT. نشریه آبیاری و زهکشی ایران, 9(5), 678-690. محمدرضا اکبرزاده; سعیدرضا خداشناس; کاظم اسماعیلی. "مدل‌سازی رواناب حوضه آبخیز اترک با استفاده از الگوریتم SUFI-2 مدل SWAT". نشریه آبیاری و زهکشی ایران, 9, 5, 1394, 678-690. اکبرزاده, محمدرضا, خداشناس, سعیدرضا, اسماعیلی, کاظم. (1394). 'مدل‌سازی رواناب حوضه آبخیز اترک با استفاده از الگوریتم SUFI-2 مدل SWAT', نشریه آبیاری و زهکشی ایران, 9(5), pp. 678-690. اکبرزاده, محمدرضا, خداشناس, سعیدرضا, اسماعیلی, کاظم. مدل‌سازی رواناب حوضه آبخیز اترک با استفاده از الگوریتم SUFI-2 مدل SWAT. نشریه آبیاری و زهکشی ایران, 1394; 9(5): 678-690. فرسایش خاک و تولید رواناب سطحی یک تهدید زیست محیطی جدی برای توسعه پایدار و کشاورزی است که می­تواند منجر به کاهش حاصل­خیزی خاک، هدررفت عناصر غذایی و کاهش عملکرد گیاهی در زمین­های کشاورزی شود. در سال­های اخیر، استفاده از مدل­سازی به عنوان راهکار ارزیابی اقدامات کاهش فرسایش مطرح شده است. مدل SWAT یک مدل مفهومی و توزیعی است که برای پیش­بینی و برآورد رواناب سطحی، آورد رسوب، خصوصیات کیفی آب و نیز برای پیش­بینی اثر انجام اقدامات مدیریتی مختلف در سطح حوضه گسترش داده شده است. هدف مطالعه حاضر بررسی کارایی مدل SWAT در برآورد دبی متوسط روزانه و واسنجی و اعتبارسنجی این مدل در حوضه آبخیز اترک واقع در استان خراسان رضوی و شمالی است. واسنجی و تحلیل عدم قطعیت مدل با استفاده از برنامه SUFI-2 انجام پذیرفت. شاخص­های P-factor،R-factor ، br2 و r2 به­منظور ارزیابی توانایی مدل SWAT در شبیه­سازی رواناب در حوضه آبخیز اترک به کار برده شد. آمار رواناب شش ایستگاه هیدرومتری در سال­های 1975-1991 برای واسنجی و اعتبارسنجی این حوضه به کار برده شد. نتایج نشان داد که در مرحله واسنجی رواناب ماهانه، ضرایب P-factor، R-factor، br2 و r2 در خروجی حوضه به ترتیب 73/0، 15/1، 53/0 و 56/0 و در مرحله اعتبارسنجی 77/0، 3/1، 48/0 و 58/0 به دست آمد. بهترین نتایج در ایستگاه شیرآباد و ضعیف­ترین نتایج در ایستگاه قره­خان­بندی به دست آمد. نتایج کلی واسنجی نشان می­دهد که مدل SWAT می­تواند ابزار مناسبی در رابطه با شبیه­سازی شدت جریان رودخانه باشد. Soil erosion and surface runoff generation is a serious environmental threat to sustainable development and agriculture, that may lead to a reduced soil fertility, nutrient loss, and reduced plant performance in the agricultural areas. In recent years, the use of modeling is introduced as a means to evaluate the impact of erosion reduction measures. SWAT is a conceptual and distribution model developed to predict and estimate surface runoff, sediment brought, qualitative characteristics of water, as well as to predict the effects of different management measures in the basin. The aim of this study was to investigate the usefulness of SWAT model to estimate the average daily flow rate and calibrate and validate the model in Atrak watershed at Khorasan Razavi North Khorasan provinces. Calibration and uncertainty analysis of the model were performed using SUFI-2. Indicators P-factor, R-factor, br2, and r2 were used in order to assess the ability of SWAT model to simulate Atrak watershed runoff. Runoff data of six hydrometric stations in 1975-1991 were used for calibration and validation of this basin. The results showed that the monthly runoff at calibration stage, the coefficients P-factor, R-factor, br2, and r2 in output basin was 0.73, 1.15, 0.53, and 0.56, and in the validation stage was 0.77, 1.3, 0.48 and 0.58, respectively. The best results were obtained in Shirabad station and the weakest results in Gharehkahnbandi station. Overall calibration results show that the SWAT model can be a useful tool in river flow rate simulation. 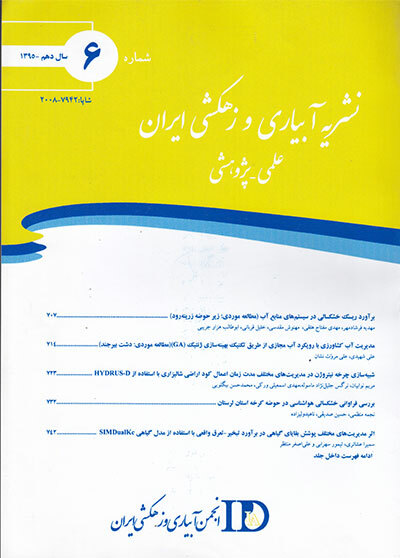 آبابایی،ب و سهرابی،ت. 1388. ارزیابی عملکرد مدل SWAT در حوضه آبریز زاینده رود، مجله پژوهش­های حفاظت آب و خاک دانشگاه گرگان. 16. 3: 41-58. اخوان،س.، عابدی کوپایی،ج.، موسوی،ف. ، عباسپور،ک.، افیونی،م و اسلامیان،س. 1388. تخمین آب آبی و آب سبز با استفاده از مدلSWAT در حوضه آبریز همدان، مجله علوم و فنون کشاورزی و منابع طبیعی، علوم آب و خاک.53: 23-9. بسالت پور،ع.ا.، ایوبی،ش.، حاج عباسی،م.ع و جلالیان،ا. 1393. واسنجی و اعتبارسنجی مدل SWAT با استفاده از الگوریتم پرندگان برای شبیه­سازی رواناب و رسوب در یک حوضه آبخیز کوهستانی، مجله پژوهش­های حفاظت آب و خاک دانشگاه گرگان.4.4: 295-312. Abbaspour,K.C., Yang,J., Maximov,I., Siber,R., Bogner,K., Mieleitner,J., Zobrist,J., Srinivasan,R. 2007. Modelling hydrology and water quality in the pre-alpine/ alpine Thur watershed using SWAT. Journal of Hydrology. 333: 413–430. Abbaspour,K.C. 2011. Swat-Cup2: SWAT Calibration and Uncertainty Programs Manual Version 2, Department of Systems Analysis, Integrated Assessment and Modelling (SIAM), Eawag. Swiss Federal Institute of Aquatic Science and Technology, Duebendorf, Switzerland. 106 p. Abbaspour,K.C., Johnson,C.A., van Genuchten,M.Th., 2004. Estimating uncertain flow and transport parameters using a sequential uncertainty fitting procedure. Vadouse Zone 3.4: 1340–1352. Abbaspour,K.C., Rouholahnejad,E., Vaghefi,S., Srinivasan,R., Yang,H and Klove,B. 2015. A continental-scale hydrology and water quality model for Europe: Calibration and uncertainty of a high-resolution large-scale SWAT model, Journal of Hydrology. 524: 733-752. Bakker,M.M., Govers,G and Rounsevell,M.D.A. 2004. The crop productivity erosion relationship: an analysis based on experimental work. Catena. 57: 55-76. Bekiaris,I.G., Panagopoulos,I.N and Mimikou.N.A., 2005. Application of the SWAT model in the Ronnea catchment of Sweden. Global NEST Journal. 3:252-257. Chu,T.W and Shirmohammadi,A. 2004. Evaluation of the SWAT model’s hydrology component in the piedmont physiographic region of Maryland. Trans. ASAE 47:4. 1057-1073. Coffey,R., Cummins,E., O’Flaherty,V and Cormican,M. 2010. Analysis of the soil and water assessment tool (SWAT) to model Cryptosporidium in surface water sources. Biosystem Engineering. 106: 303-314. Fassio,A., Giupponi,C., Hiederer,R., Simota,C. 2005. A decision support tool for simulating the effects of alternative policies affecting water resources: an application at the European scale. Journal of Hydrology. 304: 462–476. Feyereisen,G.W., Strickland,T.C., Bosch,D and Sullivan,D.G. 2007. Evaluation of SWAT manual calibration and input parameter sensitivity in the Little river watershed. American Society of Agricultural and Biological Engineers. 50: 843−855. Huang,Z., Xue,B and Pang,Y. 2009. Simulation on stream flow and nutrient loadings in Gucheng Lake, Low Yangtze River Basin, based on SWAT model. Quatern. Int. 208: 109-115. Morgan,R.P.C and Nearing,M.A. 2011. Handbook of erosion modeling. John Wiley and Sons, Ltd, 413p. Muleta,M.K., Nicklow,J.W. 2005. Sensitivity and uncertainty analysis coupled with automatic calibration for a distributed watershed model. Journal of Hydrology. 306: 127–145. Ndomba,P., Mtalo,F., and Killingtveit,A. 2008. SWAT model application in a data scarce tropical complex catchment in Tanzania. Phys. Chem. Earth. Neitsch,S.L., Arnold,J.G., Kiniry,J.R and Williams,J.R. 2011. Soil and Water Assessment Tool: Theoretical Documentation: Version 2009. Texas Water Resources Institute, Technical Report No. 406, Texas A and M University System, Collage Station, Texas 77843-2118. Neitch,S.L, Arnold,J.G., Kiniry,J.R and Williams,J.R. 2005. Soil and water assessment tool documentation, (user’s manual). P.494. Oeurng,C., Sauvage,S and Sanchez-Perez,J.M. 2011. Assessment of hydrology, sediment and particulate organic carbon yield in a large agricultural catchment using the SWAT model. Journal of Hydrology. 401: 145-153. Strauch,M., Bernhofer,C., Koide,S., Volk,M., Lorz,C and Makeschin,F. 2011. Using precipitation data ensemble for uncertainty analysis in SWAT stream flow simulation. Journal of Hydrology. 415: 413-424. Sun,H and Cornish,P.S. 2005. Estimating shallow groundwater recharge in the headwaters of the Liverpool Plains using SWAT. Hydrol. Process. 19:3. 795-807. Yang,Q., Meng,F.R., Zhao,Z., Chow,T.L., Benoy,G., Rees,H.W and Bourque,C.P.A. 2009. Assessing the impacts of flow diversion terraces on stream water and sediment yields at a watershed level using SWAT model. Agronomy. Ecosyst. Environment. 132: 23-31.